Debra Diamond, Alec Baldwin, Hilaria Baldwin and Dame Jillian Sackler taking the measure of a certain man. Photos by Tony Powell. 17 Oct. 2013/WASHINGTON, D.C. – JUST what the U.S. capitol – the world’s most dysfunctional city needs – some enlightenment. The traveling exhibit, moored at the Arthur M. Sackler Gallery through 26 Jan. 2014, is being called the world’s first dedicated to yoga. “Yoga: The Art of Transformation” is an interactive, multimedia, uber-informational and comprehensive installation of more than 120 items dating from the 3rd to the 20th century. Visitors can expect ancient court paintings, icons, manuscripts, photos, books, films, tours, classes and Temple sculptures. Pari Bradlee&Co. 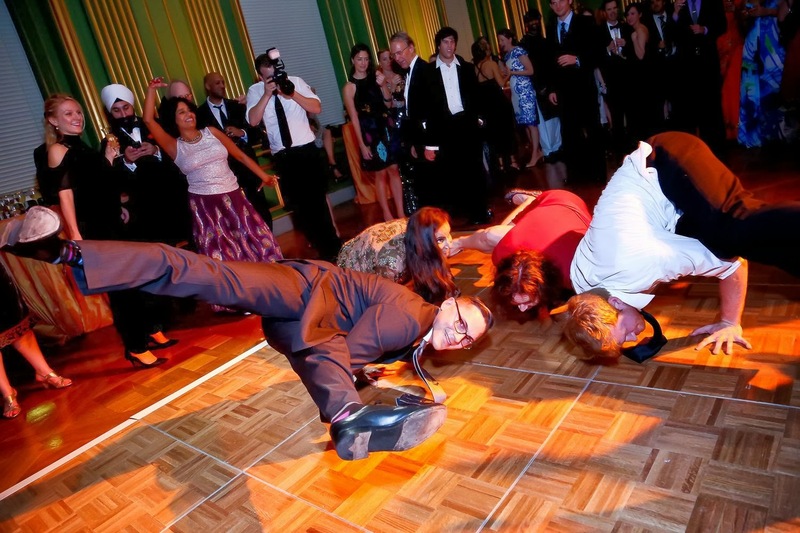 bring yoga to the dance floor. Here is a must-visit destination for yoga enthusiasts and/or newbies interested in learning more about how this art has transformed body and soul and how yoginis and yogis have figured in Indian society for 2,000-plus years. Gala chairperson Chandrika Tandon entertains the crowd with a little night music. “Some Enlightened Evening” has a dual role, as it regards “Yoga,” in that it is also a fundraiser. 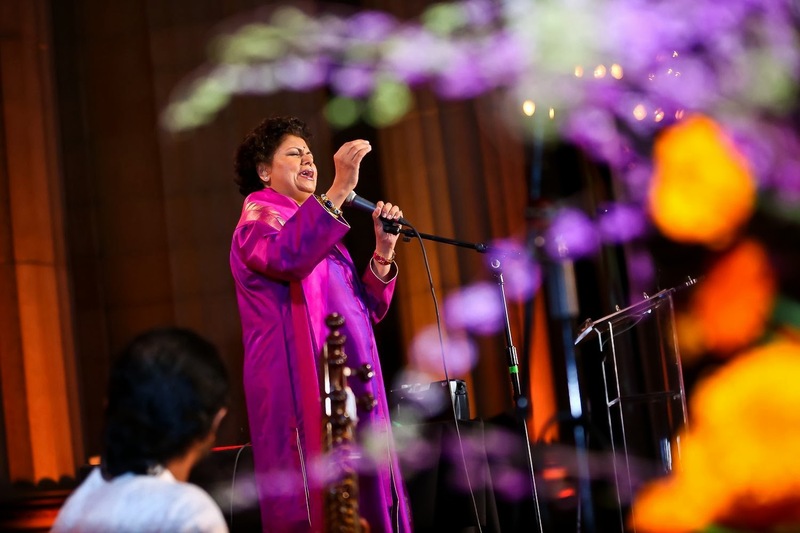 Gala chairs Dame Jillian Sackler, singer Chandrika Tandon, as well as yoga power couple Hilaria and Alec Baldwin orchestrated a soiree where cuisine was prepared by a world-class chef, a yoga performance was given, as well as a mini-concert by gala chair member CT.
A LuLu Lemon performer shows how it's done during the "Some Enlightened Evening" gala. Also during the evening, at least one scion took to the after-gala dinner dance floor to strike some poses – yoga-style. What Precisely Says Didier About the Foot in His Hand? 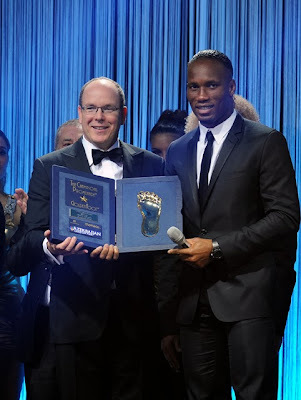 Prince Albert II (left) of Monaco and Didier Drogba with the Golden Foot Award. Photo from Getty Images. STAY tuned to learn some of footballer Didier Drogba's thoughts about winning the 2013 Golden Foot Award and having an immortalized footprint in Monaco, France. In New York City, meanwhile, the American Folk Art Museum created buzz for its upcoming (January) exhibit, "Folk Couture: Fashion and Folk Art" with the "Folk Couture Benefit Gala" hosted by Tim Gunn. A day later on a Gotham runway were seasonal styles from DKNY, Bow & Drape and JustFab shoes in support of the first-ever fashion show for the first-ever Techweek New York City. PWInstitute is a top rated piping design institute in Vadodara. We are a team of professionals to help you related to your subject and job. To know more about piping design course in India. Teaching though the arts requires students best essay help to engage in the act of creative art. Aspiring to wind up noticeably an astonishing web journal author like the essayist of this blog.